Allison Wolfe - ZineWiki - the history and culture of zines, independent media and the small press. Allison Wolfe is a writer, musician and zine editor. While attending the University of Oregon, Allison met Molly Neuman and they soon teamed up to create Girl Germs. This pro-girl zine was one of the seminal publications that instigated the Riot Grrrl movement. At the same time, the two zinesters formed the band Bratmobile, in which Allison sang and Molly played drums. 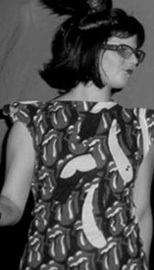 After Calvin Johnson of K Records introduced the two women to zine editor Erin Smith of Teenage Gang Debs, she joined the band in 1991, playing guitar. The trio relocated to Washington D.C., meeting up with Jen Smith, editor of Red Rover, who also played with the band. While in Washington D.C., Molly began another zine, entitled riot grrrl, with contributions from Allison, Jen, and the members of Bikini Kill, who had also relocated to Washington D.C. from Olympia. The writers urged other girls to copy and pass along the weekly free riot grrrl mini zine and it became a vehicle to announce the weekly meetings that were being held for girls to get together. Arriving back in Olympia for the summer International Pop Underground festival in August 0f 1991 without Jen Smith, who stayed in Washington D.C., Bratmobile played shows on an all-female bill called "Love Rock Revolution Girl Style Now" on the first night of the festival, an event widely regarded as the moment that the Riot Grrrl movement began. After releasing two albums and a number of singles, Bratmobile broke up in the 1990s. It's thought that the media frenzy that accompanied Riot Grrrl led to the breakup. Allison went on to play with Erin in the band Cold Cold Hearts. Bratmobile reformed in the 2000s, touring and releasing a number of recordings before splitting again. Since then, Allison has started a new group, the three women Washington D.C. band Partyline. She also performs and records with the L.A. electropunk band Hawnay Troof. Besides her own zine, Girl Germs, and contributions to other publications, such as Fag School, Allison has been featured, interviewed, and reviewed in many other zines. This page was last modified on 19 November 2011, at 19:11.